A wood ceiling adds warmth and design interest to any room in your home. Wood panels and boards come together in distinctive patterns that suit rustic, eclectic, shabby chic-style, French country or country design styles. Camouflage an outdated popcorn ceiling with wood panels, or build a new ceiling structure for your front porch that pays tribute to days gone by. A wood ceiling can add warmth to your space. One type of wood ceiling that you can use in any interior room of your home or on a porch is a beadboard ceiling. Beadboard is available in grooved panels in sheets of varying widths and lengths that range from 38 to 44 inches. Pre-primed and plain beadboard panels are made from wood veneer, hardwoods or pressed wood products, such as medium- and high-density fiberboard. Cover an outdated or damaged ceiling with beadboard panels to immediately enhance the design of your room. New beadboard panels are attached to ceiling joists or over a plywood substrate. Beadboard panels add charm to shabby chic-style, beach-themed or French country interior ceilings. Add rustic charm to any interior or porch ceiling with a tongue and groove pine ceiling. A tongue and groove ceiling design interlocks pine wood boards together to create a ceiling pattern with old world style. Select knotty pine wood boards with grooves along one side and tongues, or protruding wood strips, along the other to create the ceiling. The tongue side of the board fits into the grooved side of another board. The seam between the two boards is V-shaped or flush, depending on the angle of the cuts along the edge of the pine board. Install tongue and groove pine boards one by one with a screwdriver and wood screws. Attach the boards over a plywood substrate or directly into the ceiling joists. Create an eclectic wood ceiling with decorative plywood panels and strips of wood trim. 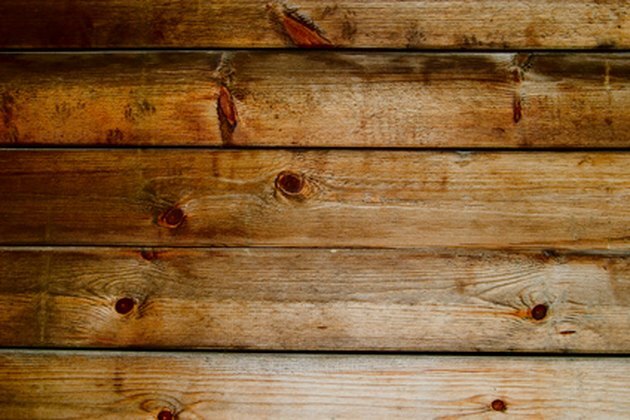 Stain or paint plywood panels and attach them over an outdated ceiling or directly onto the ceiling joists. Ensure that you use wood screws to hold the panels in place; nails can become loose over time from the weight of the plywood. Enhance the finished plywood with random strips of decorative wood trim stained or painted for contrast against the plywood. Place the trim along the seams created by the joined panels and on the face of the panels. Make geometric patterns with the trim or create random designs along the ceiling. Use waterproof construction adhesive or wood screws to attach the wood trim to the wood panels.